A former lighthouse keeper’s cottage is offering house hunters the chance to experience the ultimate in back to basics living – a property with no water or electricity supply and access is restricted to a one mile walk from the nearest road or by boat if the path becomes impassable in adverse conditions. Leading Scottish estate agent Bell Ingram is marketing the property named Rubha nan Gall which comes with 80 acres of land including a mile of unspoilt shorefront. 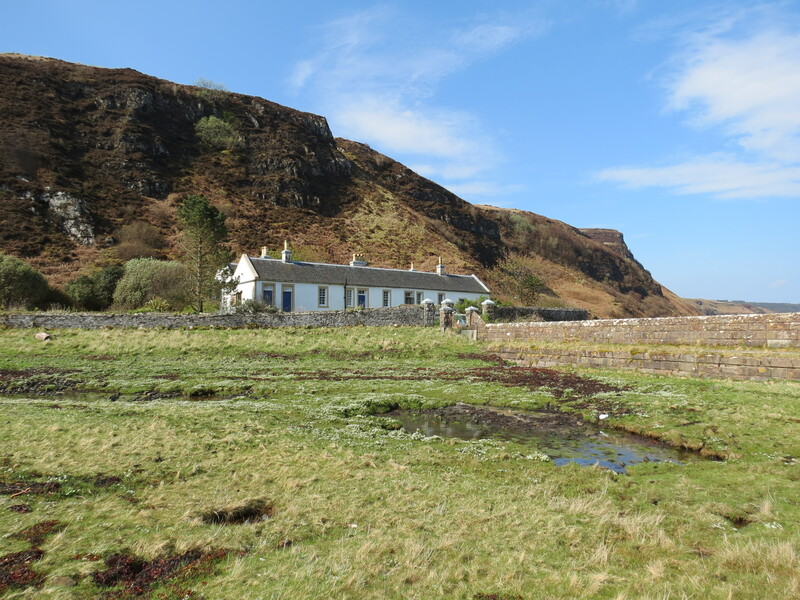 The cottage occupies a stunning location on the Isle of Mull, a mile north of the famous Tobermory village, and enjoys uninterrupted, spectacular views across the Sound of Mull and the Ardnamurchan Peninsula. Access is restricted to the ‘Old Road’, a mile-long winding hillside footpath leading from Tobermory to the Rubha nan Gall lighthouse. It can also be accessed from the sea via a landing jetty, something essential as access along the ‘Old Road’ can be limited due to adverse weather during the winter months. The property, being marketed at offers over £225,000, has four bedrooms, sitting room, study, parlour/kitchenette, WC, washroom and seven store rooms. Gregor King of Bell Ingram’s Oban office said: “This is definitely a unique property which offers superb potential for buyer who is really looking for the ultimate get-away-from-it-all property, or the buyer who is looking for a property in a stunning setting that can be developed into a luxury home. “The house in its current state offers a real back-to-basics living experience – and while this may be appealing to some buyers, there is potential for the property to be extensively modernised. “Mull is famed across the UK and further afield for its rugged natural beauty and awe inspiring coastline – yet it is only 45 minutes by car ferry from Oban or there is a small private airstrip. The lighthouse and cottages at Rubha Nan Gall were originally built in 1857 by David and Thomas Stevenson with a painted stone exterior and set under a slate roof. Originally designed as two semi-detached houses, the property now comprises a single, spacious dwelling, but otherwise remains almost exactly as it would have appeared when it was first occupied, with no mains electricity, water or sewer connections. Water is accessed from a private spring, heat is provided by solid fuel fires or stoves, cooking by stove or gas, and light by paraffin lamps or gas lamps. Externally, the house and garden are enclosed within a stone wall – the garden has previously included an extremely productive vegetable patch. Included within the sale is an area of land extending to some 80 acres including areas of grazing/farm land and wooded slopes running down to the shore. So peaceful are the surroundings that the former owner was a writer who found the solitude ideal for his work. Tobermory boasts an excellent range of dining, cultural and shopping possibilities as well as a medical centre, schools, sporting facilities and a nine-hole golf course. There is a main line train service from Glasgow to Oban with connections to the Mull ferry, while boat services are also available from Morvern and Kilchoan on the Ardnamurchan Peninsula. Established in 1899, Bell Ingram is a multi-disciplined firm of chartered surveyors, forestry managers, estate agents, architects, building surveyors and energy specialists. With more than 130 professional staff across 11 UK offices the firm provides local knowledge with national coverage.